I've ordered this toilet paper before, and I think it's very good quality. Doesn't fall apart, is a good 3 ply. Also nice to know it is made from recycled paper. Meant to post this offer before as it ends at 23.55 tonight, but Amazon is offering a promotional 20% off your first Subscribe and Save order of certain items. This makes the £14 pack of 4 x 9 rolls, down to £9.80, 27p a roll. 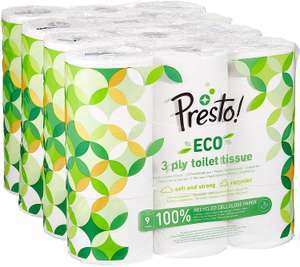 Good deal - minor correction, it's £9.80 or 27p a roll. Incidentally, it let me order another with the discount. It's loo roll, lots and lots of loo roll. It feels nice when I tenderly fold it and gently present it, not so nice when I drunkenly thrust it there. So basically, if your technique is any good, this is the paper for you, but if you are a novice at it, follow the advice of Francois Rabelais the 16th century French monk, and use the neck of a goose. Is it better than Nicky elite 3 ply though? I do hate brown ballerinas and it is £4 for 18 rolls. 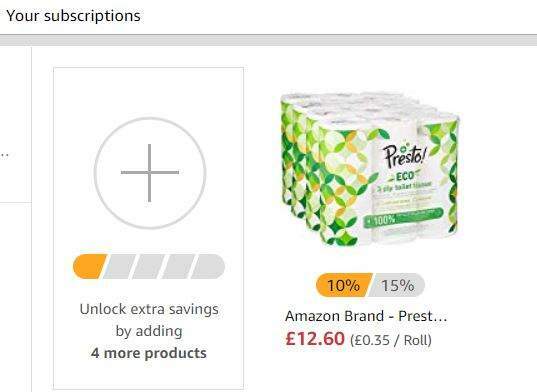 Good deal - minor correction, it's £9.80 or 27p a roll. Incidentally, it …Good deal - minor correction, it's £9.80 or 27p a roll. Incidentally, it let me order another with the discount. Is it better than Nicky elite 3 ply though? I do hate brown ballerinas and …Is it better than Nicky elite 3 ply though? I do hate brown ballerinas and it is £4 for 18 rolls. They have a 4 ply non recycled material option amazon.co.uk/dp/B077X4G7F2/ref=cm_sw_r_cp_awdb_t1_2GpTCbXNH4YV6?th=1&psc=1 not sure if the 20% offer applies to this type though, doesn't show up on the page for me. Although it's 35p/roll or to start with which isn't bad. Whoever commented about the bamboo loo roll, that has a much larger carbon footprint as it is shipped in from China. This is made in UK, and from 100% Recycled Cellulose. I did try the bamboo loo roll but it was very thin quality so had to use more. Also looking at the amazon reviews, the bamboo paper has caused a lot of blocked drains and problems with toilets.